Ok, yesterday was spent at one of the most amazing places in the world, without a shred of doubt, but right now I have to blow of some steam. When crossing from Puerto Iguazu (the town near the falls on the Argentinian side) to Foz do Iguaçu (the Portuguese counterpart) they assume a lot of the people aren't staying more than over the day to see the brazilian side of the falls so they often don't get an entry stamp into brazil and unless you ask the bus driver specifically, he often don't even stop by the Brazilian border control. This I was not told by the receptionist at my hostel who I asked a bit about getting to Rio, nor by any other person I questioned about getting over. When I arrived to Foz do Iguaçu to get a bus ticket they just said "nope, get a stamp"... But in Portuguese of course... Which I do not speak five words in. Luckily I got ahold of a informations desk-guy who spoken pretty fluently and he explained that unfortunately I had to grab a bus to the urban bus station, then another one to the border, then sweet talk a bit to make sure I got the entry stamp, then wait for another bus back to the urban station and from there catch a fourth bus back to the inter-city station... For this quest, finding 4 busses to the right station, getting a stamp and ultimately buy a ticket to Rio, in a town I knew nothing about 'cept for a map, with a language I did not speak, using a currency I did not posses nor any means of exchanging it, I had roughly 90 minutes. Funny thing is, I actually made it, walking around two different bus stations looking like an abandoned puppy with a gi-normous backpack until I found some one who could understand "Border" or "bus station" (FYI, it is "frontera" and "Rodoviarío" in Portuguese). I was even lucky enough to get a nice lady speaking English in the border control. The last stage was getting a bit panicking though, which resulted in me pretty much rushing into every bus stopping, learning to pronounce "Rodoviarío" with a multitude of bus drivers until one nodded with a sigh of resignation (presumably due to my inexplicably clear and understandable pronounciation. Oh shut up, I know he was properly impressed and exasperation is just a Brazilian show of awe, and that's that!) and waved me towards the back, as if to get rid of me. This novel about my escapades in Foz is coming to a close, since I managed to get tickets to rio and should get there tomorrow morning. My hope of getting to Ilha Grande was shattered though, and if I want to go there I have to go on Friday, which means I'll be back on Sunday, in the earliest scenario. That leaves me with two full days in Rio, far less than I would've liked. Still, I'm on my way there at last. 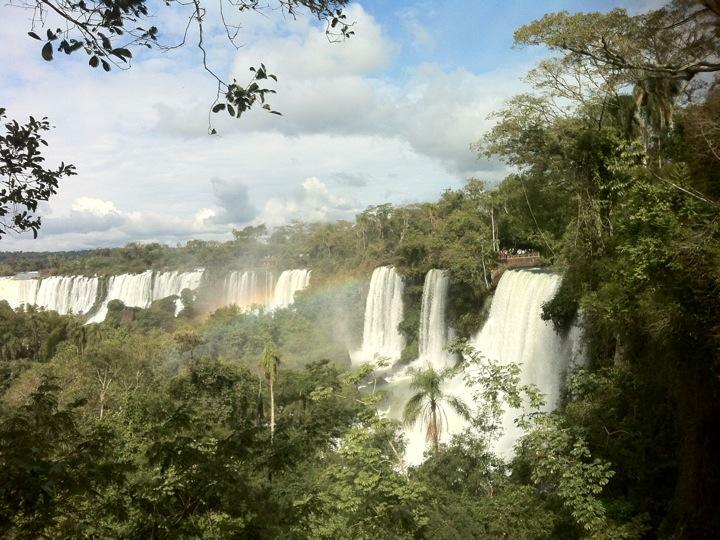 Now, for the far more important, and impressive part of the post: the Igassu Falls or Cataratas del Iguazu! There is just one proper word for something like the falls; breathtaking! When I first walked in along the trails and realized that it wasn't a path with people walking, but rather a millipede of people wedged together that seemed to stretch around the entire park, I was a bit turned off. Furthermore the first few falls you see are beautiful, but really not as impressive as I hoped. After that though...it is just incredibly awe-inspiring. When you step around a corner and in front of you is not one big fall, or a couple, but literally hundreds, all shapes and sizes anywhere you look, it makes everything you paid to get in, all the lines you stood in, all the hassle, worth it. No picture I've seen has done it justice, it is a scene that has to be experienced to be appreciated. It is not the single widest curtain of water in the world, Victoria Falls holds that distinction. Nor is it the highest fall, for that, see Angel Fall. But the magnitude and the beauty doesn't root in being a consistent fall, neither in width nor height. It is wonderful exactly BECAUSE it is split into 272 different falls, each with its own life, its own stream. It feels like watching a hundred life forms instead of a hundred waterfalls. It is quite a special feeling when everywhere you look there is another fall, all from the same river. Spectacular, wonderful, gorgeous... The truth eludes all those words. Ok, enough praise, but is sure was cool. Especially going straight into the bottom of the falls in a boat, getting soaked to your bones. I chose not to do the side on Brazilian shores due to lack of time, but I can imagine the view is equally spectacular, nowhere more so than over The Devils Throat (Garganta del Diablo). Now it is time to save some battery though so the phone last all the 22 hours to Rio. Alejandro Thank you for sharing this tips.. I am lkioong for places that I can visit while I am staying there for the FIFA World Cup 2014.. Maybe I'll try some of the famous beaches there and the famous Jesus Christ Statue in Rio.. Hope to do all these while waiting for the games of my favorite teams..